Remember my Extreme Playhouse makeover post? I am getting impatient (with myself) and the little kiddo is too! Compare! That gorgeous yellow brightens up the playhouse for sure! So I have moved on to the door. "big"house is getting ready to get its own makeover now! 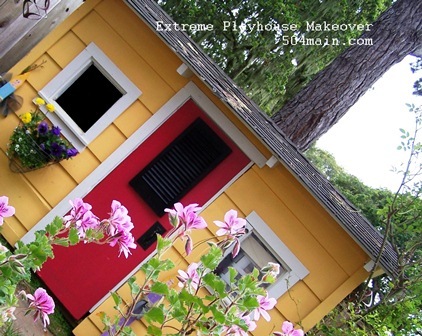 I still need to get moving on the rest of this playhouse makeover! The exterior trim, interior walls, and floor to be done! waiting for the weather (and kiddos) to cooperate. BUT you should use the proper EXTERIOR Paint for your projects. I will also repaint this door (if it needs it). Don't judge...I a a messy DIYER! Krylon Fusion indoor/outdoor spray paint, Black (I used the Fusion because I had some handy. You can also use the Indoor/Outdoor product). NOTE: Some of the ways I have gone about fixing my playhouse is for convenience. This playhouse is older and has not been well tended to, long before we inherited it. I did not want to open a "can of worms" by removing doors and hardware. I painted around and made other adjustments to keep the playhouse in tact and on the economical side. Go check out the rest of the DIY at The DIY Club! 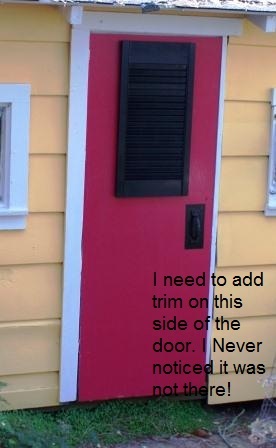 so I am headed back to get a Gallon of the Trim and Door Paint! 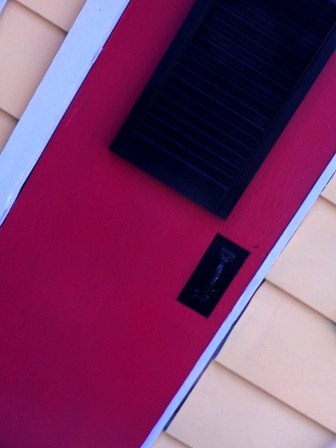 What color is your front door???? disclosure: this post is affiliated with The DIY Club, some products have been furnished by sponsors. Cant wait to see the whole thing! !